The Spanish novel of Miguel de Cervantes says that hunger is the best sauce in the world. And it is – even when this hunger is for real money. Knowing all your weak points, Playtech slot presents one more way for you to mix pleasure with business. The heroes of popular classic books are gathered on the 5 reels screen and invite you to no download and mobile gambling fun. Want to feel like a real knight and take a squire to help you? 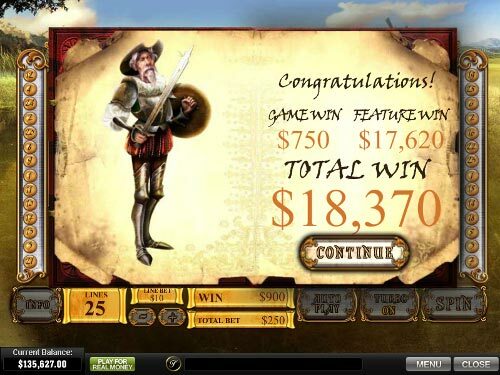 Then The Riches of Don Quixote Slot Machine is right for you, because the video game offers all that and even more. 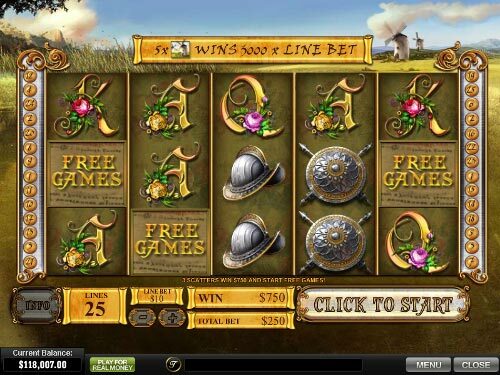 The adventures, multipliers, features and high wins are waiting in the video slot. There are no fewer than 25 paylines for you to conquer and win. Be brave and noble, and you’ll have people talking about your exploits. They say you should read a lot of books to become wise and smart. 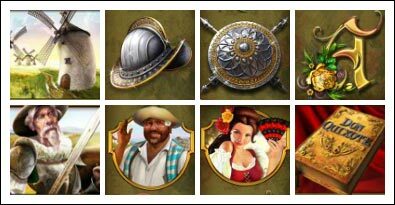 It’s true – one more reason for you to catch 3 Don Quixote Book icons that can activate La Mancha Free Games with frozen wilds on the middle of the screen. 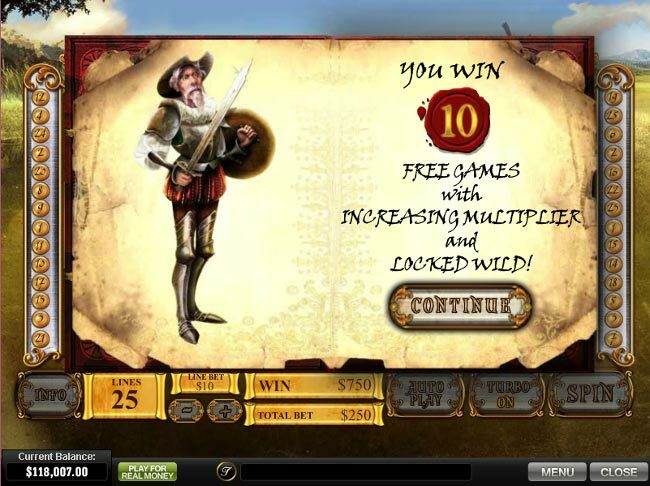 Now you have 10 Free Spins round to prove that nothing can stop you. There is also a Windmill to appear right in the middle of the 3rd reel. The extra wild symbol also comes to your rescue. Are there any surprises waiting for you? How about starting with a 2x Multiplier and increasing it 1+ with every 2 spins? Don’t get upset that the feature can’t be reactivated, you still have great opportunities to make a killing. Stacked symbols are here to reward extra gains, because 6 of them create 2-high stacks. Come closer and you will see that the Windmill wild symbols can offer you even more than you thought. The Windmills replace the other symbols, still avoiding the scatter. Well, ho cares, you can go on collecting winning combinations. Meow. Is there someone else here? Perhaps the heroes of other online slots, like the kitty from Cat Queen Slot, have something to show you. The Don Quixote Book can be useful not only for triggering the bonus game. The scatter symbol has some more advantages than just bonus round activation. To snag all the benefits, grab up to 5 Book scatter symbols and catch either 1x, 3x, 10x or 100 times Multiplier. 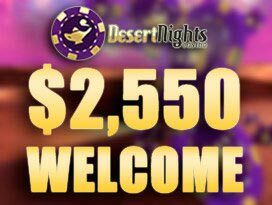 This is the moment to think about staking the max amount and hitting the $25,000 real money prize. Why do people start a trip and journey? Some of them want to collect memories and emotions; the others look for new things to gain. On this journey, you can grab the top jackpot. 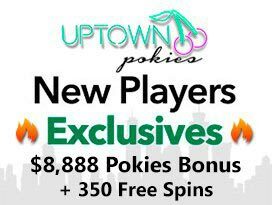 Pick a coin size ranging from $0.01 up to $10, and a $250 max bet will become your key to riches. Here comes the adrenaline rush. Everyone wants to hit $30,000 or 3,000 coins with just one spin. And all you need is a line of 5 Windmill icons. Well, the chances to grab the main prize of Don Quixote video slot are even higher during the bonus round 😉 This symbol is bound to become your mascot for the whole game. And there is no way to escape the winnings with so many lucky strikes provided. Classics aren’t boring anymore in 2019. 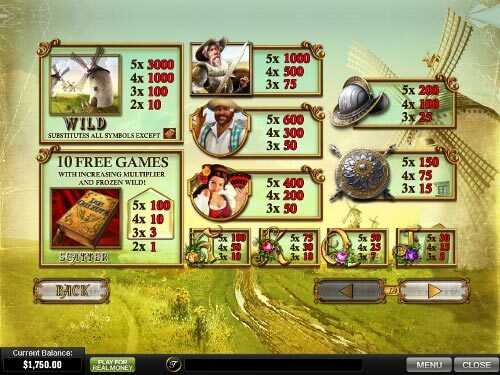 Play The Riches of Don Quixote Slots Machine and become friends with Don Quixote and Sancho Panza. This generous man along with his squire is ready to share everything he has with you; just be patient playing with the highest stake to achieve higher gains.